Construction fencing had already been erected around a popular hill in Carl Schurz Park when the community began to find out about the city’s plans. A move which as angered Yorkville residents. This is not the first time the Parks Deparment has moved ahead with a plan in CB 8 without the communty knowing about it. (Photos: NYC Park Adovcates) Click on images to enlarge. There will be no sledding this winter along with any other public uses for the better part of a year residents were told last night. Dozens of community residents poured into a normally sleepy July CB 8 Parks Committee meeting to express their anger and frustration over a city plan to build a temporary road in the middle of a popular hill in Carl Schurz Park, a few feet way from Gracie Mansion. A plan they knew nothing about. A rumor had circulated that the city was planning to use the beloved hill - popular with picnickers, sunbathers, readers, and sledders in the winter - as a staging area for the city’s long delayed reconstruction of a nearby section of the East River Esplanade. In May a fifty foot section collapsed into the East River behind the Mayor’s house after decades of deferred maintenance. The rumor was at least partially true. Last night Parks Department representatives confirmed that it is planning to build a temporary road, made of gravel and recycled asphalt in the middle of the lush green hill in order to accommodate construction vehicles. The city denied it was going to level it but said two trees would be removed. The city expects the work to begin by the end of summer and be completed by May 2018. After the work is finished the hill would be restored. Like a page out of Robert Caro's The Power Broker, the community found out about the plan not from the City but instead from a construction worker at the site. The city will begin fixing sections of the East River Esplanade after a fifty foot section collapsed into the East River behind Grace Mansion in May. Once word leaked out fliers were plastered throughout the community warning of the impending plan. “That’s a crazy way to find out the information,” said neighborhood resident Helaine Eisenberg. “If the people who are making the decision are not directly communicating with the community its affecting, that’s a problem," she said. Compounding the problem is that Community Board 8 ranks dead last in the provision of parks and open space city-wide. “Even if we temporarily lose park space that's terrible for this community because we have very little and that’s disturbing,” she said. One of the main sticking points was why the community was only finding out about the plan now after construction crews had already begun erecting fences around the popular grassy knoll. During the meeting the Park Department was asked several times why the community was only finding out about the plan now. Eleven-year-old Ethan Ladder, son of CB 8 Board member Craig Ladder, stepped up to the mic and asked why the public had not been notified. After word had leaked out organizers plastered the community with fliers warning of the impending plan The city is planning to use a beloved feature of Carl Schurz Park as a staging area for construction vechiles located at East End Avenue and E. 89th street. Manhattan Parks Commissioner Bill Castro responded later by saying that both the Community Board and the office of City Council Member Ben Kallos had been notified of the plan several weeks earlier. Castro did his best to avoid admitting that the city had not informed the community of its plan to use the park as a staging area. He said there was a press conference at the time of the collape in May inferring that his issue was covered then. There was no press conferance and there was no coverage. At the time of the collapse a single individual from the Parks Department spoke to individual media at the site and addressed questions. The use of the park as a staging area was never brought up. This also directly contradicts what his colleague said had just stated moments earlier about how the plan had recently changed a few weeks earlier which caused the new plan to be rushed. The veracity of Mr. Castro’s claims were challenged. He was informed that earlier in the day Council Member’s office told this author that they had not heard of the city’s plan and that at this point it was only a rumor they heard from community members. When pressed on whether or not the Council member knew a few weeks earlier Castro backed off the claim made moments earlier. “I can’t say whether he knew that or not,” Castro replied. “He may have,” he said adding that he hadn’t said he had. After the meeting several CB board members and as well other people who called Council Member Kallos’s office told the same story, that it was just a rumor and it had not been officially confirmed by the city until last night. This is not the first time the Parks Department has moved ahead with a plan in Community Board 8 without the community knowing about it and Bill Castro was in the middle. In April 2012 the Parks Department was blasted over its handling the controversial tennis concession in the Queensboro Oval Park softball field under the 59th Street Bridge at York Avenue. Questions were raised, once again, why the community was only founding out at least four months after the city had made a secret deal that allowed the concessionaire additional time to operate. The lack of transparency then was particularly inflammatory considering the last time the issue of the extending the tennis concession surfaced in 2010 was when the agency’s revenue division struck a behind closed door deal that allowed the private tennis club on public park to go from seasonal to year-round. The Community Board vote came five months after the concessionaire had already signed a contract with Parks. Opponents of the plan charge they had not been properly notified of the proposal. At Thursday's meeting several questions were also raised regarding why the work site was being accessed through the park instead of from barges on the water which is how major seawall esplanade repair work is normally performed. Park representatives claimed that was not possible due to logistics. “I’m a Hill-Hugger,” one young attendee carefully wrote on a home made sign. One by one community members stepped up to the mic and voiced their concerns. Residents made it very clear that they were still reeling from Mayor De Blasio’s decision to support the building of a massive Marine Transfer station on 91st St accross the street from the park. Critics have long pointed out that this is the only one being built in the city in the middle of a park, as well in the middle of a dense residential community. That facility is expected to begin operation in 2018. The hill is located in northern part of the park on East End Avenue between 90/91st Street, few feet away from the Mayor’s official residence. 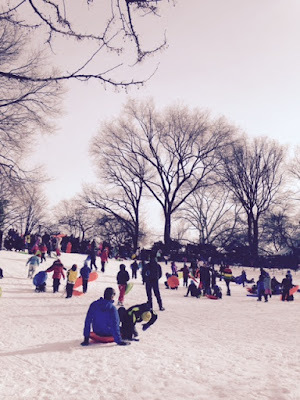 During the cold months the west facing side of the hill transforms into a winter wonder land with children of all ages hurriedly making thier way down the snow covered grass. The view from the top looking east offers panoramic views of the East River and the Tri-Borough bridge, inspiring both day and night. During the growing season a small community garden provides a needed respite from the tens of thousands of cars daily that traverse on the FDR Drive located directly under the hill. “My husband and I for all the years we’ve lived here have used that particular hill as a place to picnic and read on the weekends,” Helaine Eisenberg, who has lived around the corner from the park for 30 years said afterwards. Construction fencing was erected this week around the popular hill located on the north end of Carl Schurz Park. (Photos: NYC Park Adovcates) Click on images to enlarge. What a rotten thing to do. The mayor just has passive contempt for his constituency, except for the ones who run bars and restaurants and the predatory developers he sold his soul to.